John Parkinson (1567-1650) was an English herbalist and botanist. He was apothecary and Royal Botanist to Charles I. He published two books Paradisi in Sole Paradisus Terrestris first edition in 1629 , with a second edition in 1656, followed by Theatrum Botanicum in 1640 . These two books are interesting not only for their differing illustrations but also for the lists of vines and grapes. I originally intended to compare the different lists of these two books but became distracted by the inclusion of vines from Virginia and Canada. American plants were brought back to Europe from the earliest years. These specimens were not only cultivated in gardens but botanically classified and described. This post is not meant to be exhaustive, rather it is meant to be an exposure into the early botanic descriptions of these two vines. It has begun to appear that John Parkinson published the first English scientific names and botanic descriptions of the wild vines of Virginia and Canada. John Parkinson from Theatrum Botanicum. 1640. In Paradisi in Sole under “The Ordering of the Kitchen Garden” John Parkinson describes the art of tending grapevines and under “The Orchard” section he provides a detailed description of the known grapevines of England. He comments that there was “so greate diversities of Grapes, and so consequently of Vines that bear them, that I cannot give you names to all that here grow with us.” His lists of plants include the grapevine from Virginia. He relates that his friend John Tradescant, the great nurseryman, had 20 varieties growing. The 1634 publication by John Tradescant the Elder of Plantarum In Horto lists six specific grapevines along with “divers other” but no specific mention of the grapevines of Virginia or Canada. John Tradescant the Younger first visited Virginia in 1637 so it is possible that there were no vines cultivated in their nursery when Plantarum In Horto was published. In 1656 John Tradescant detailed in Musaeum Tradescantium all of the rarities in his London nursery. There are eight different vines and grapes listed under Vitis and an additional eight unclassified grapes. Amongst the classified grapesvines appears Vitis vinifera sylvestris Virginiana “Virginia wilde vine” and Vitis vulpina Virginiana “Fox-Grape from Virginia”. Vitis Vinifera. The manured Vine. Vitis lacimiatifolius. The Parsley Vine or Grape with thin cut leaves. Labrusca sive Vitis sylvestris Eurepea. The wild Vine of Europe. Vitis Sylvestris Virginiana. The wild Vine of Virginia. Vitis Sylvestris trifolia Canadensis. The wild Vine of Canada. Vitis Vinifera and Vitis from Theatrum Botanicum. In my post A Visual History of 16th Century Herbal Illustrations of Vitis Vinifera I included 11 different illustrations of grape roots, vines, stems, tendrils, and clusers. In Paradisi in Sole Paradisus Terrestris, John Parkinson chose to illustrative five different grape clusters centered amongst a fig tree branch. Each grape cluster is on a bit of vine, four with a leaf and three with a tendril. This is quite unlike the illustration in Theatrum Botanicum in which Vitis Vinifera is shown as a single plant with vine, leaves, tendrils, and three clusters of fruit and Vitis Lacintatis solise is shown as vine, leaves, and tendrils. This places the illustration of Theatrum Botanicum in similarity with the 16th century Herbal illustrations. Eleanour Sinclair Rohde describes Paradisi in Sole Paradisus as more of a “gardening book” whereas Theatrum Botanicum is an Herbal. The later being a more botanical work would naturally include full illustration of the vines for identification purposes. What is particularly interesting about these two lists are the inclusion of Vitis Sylvestris Virginiana or the wild vine of Virginia in both lists published in 1629 and 1640 with the inclusion of Vitis Sylvestris trifolia Canadensis or the wild vine of Canada, only in the second list published in 1640. In other sections of Paradisi in Sole Paradisus Terrestris there are references to Canadian plants such as Martagon Canadense Maculatum which was “brought into France from Canada by the French Colonie, and from thence unto us.” From my post “Vines in great Abundance”: The First Vintages of the Colony of Virginia I detail how the grapes of Virginia were first mentioned in 17th century English publications between 1609 and 1613. This places John Parkinson’s mention of Virginia grapevines some 20 years and subsequent classification some 31 years after the first 17th century English publication. Samuel de Champlain saw many grape vines in Canada on what they named the Island of Bacchus in 1605. Samuel Purchas mentioned the “wilde Vines” of “S. Champlain” in his 1614 publication Purchas His Pilgrimage. This places John Parkinson’s listing of the Canadian grapevine 26 years after the publication of Samuel Purchas. While these delays include the dissemination of published accounts they would also reflect the delay before an actual botanic specimen or botanic description arrived in England. IIX. Vitis sylvest. Indica acinis pruin sylvestris. Caspar Bauhin lists both Vitis Virginiana and Vitis Canadensis in the appendix because Jean Robin and his nephew Vespasian Robin collected and grew plants from America. In 1622 they received six plants from America which they grew in their garden and sent at least one vine to Caspar Bauhin. It was Caspar Bauhin who named the vines Vitis Virginiana and Vitis Canadensis. 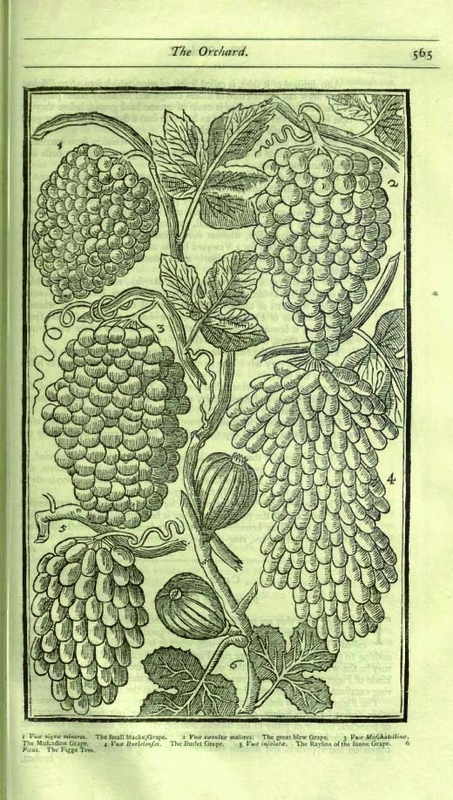 The descriptions in the main body of the book are more general with that of Vitis sylvestris Americana as edible grapes from new France and Vitis sylvestris Virginea as two types. The first thin and sour and the second, large, sweet, and edible. In the appendix the descriptions are more specific with the Canadian vine named Vitis Canadensis and described as a bushy vine with trefoil grapes on long stalks from the garden of another. Vitis Virginiana is descirbed as a broader, rounder, thin, and high-climbing, little vine from the garden of Robini. Only Vitis Virginiana is listed, without description, in Wilhelm Lauremberg’s Botanotheca published in 1626. I take this to be the wild vine of Virginia because it is in the same sentence as Vitis Corinthiaca or the currant producing Coranthe vine. This was published in Rostock, Germany where the 15th century university was founded. Adriani Spigelii’s 1633 Isagoges in rem herbariam libri duo lists both Vitis Vinifera and Vitis Sylvestris trofil. Americana, presumably the parsley vine of Canada, without description. In John Smith’s A Map of Virginia published in 1612 he describes two types of grapes vines in Virginia. The hedge grape, from which wine was made, came from vines which grew to the top of trees and bore fruit when they were exposed to sun. The second type he described as, “neere as great as a Cherry, this they call Messaminnes; they bee fatte, and the juyce thicke”. Unfortunately this fruit did not make pleasing wine. Roughly 30 years later John Parkinson describes three different Virginian vines and grapes and one Canadian vine and its grape. The inclusion of both scientific names and botanic descriptions appear to be the first published in English for these grapevines.